Idris looks to be the most modern language designed for general purpose use. It is based on some of the very latest programming language research. What better way to stay ahead of the curve than that? 2. Idris also has a cool language feature called holes. Here you can get a program to compile before you have completed it, essentially adding a placeholder before you’ve implemented a part of it. Even better, Idris will help you by being able to show you the type definition expected in the location of the hole, and even auto-generate code based on the surrounding context in many situations, where it can be inferred. I love the idea that you can encode expression invariants directly into types and they will be checked by the type system! Another thing I like about Idris is that it has eager evaluation, as opposed to non-strict (or lazy) evaluation, such as a language like Haskell. While powerful, laziness can lead to all kinds of unexpected gotchas and can make reasoning about the performance or runtime characteristics of your program more difficult. 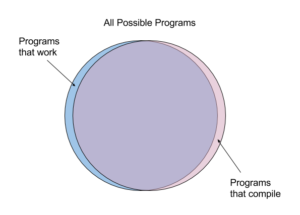 The idea is that Haskell increases the overlapping area between the two circles, as compared to other programming languages. The extent to which you can encode properties of your program in the code and have them type checked is quite tantalizing, and I’ve decided it’s well worth any leaning curve involved. Idris is also approaching 1.0. This would indicate the language spec will be finalized and the implementation will be considered stable. Despite the language being relatively new, setting up Idris is actually really straight-forward. These steps assume you are on OSX. First, you’ll need to get the Idris language binary, which is available pre-built for OSX. Idris has editor support in a number of popular editors including: Atom, Emacs, and Vim. In this post, we’ll do the setup in Atom. Nice. Ok, so you might be asking why the heck use the REPL is you’re just going to have to switch to the command-line to run this? Well, this program produces side effects, so you’re not really going to have a meaningful result until you actually run it. Here is an example from the idris-demos repo on github. It’s meant to give just a basic idea of what’s possible in the language. This is a recursive function implemented using pattern matching. If this syntax looks foreign to you, it comes from the ML-world and languages like Haskell. While not required, learning Haskell can really help you understand the world of dependent-typing, and is the path I’m taking to better learn and understand this stuff at the moment. You might already be familiar with the idea of a zip function. vZipWith will take a function and a pair of vectors, and create a single vector where each element is the result of applying the function to the pair of elements in each vector at each step. But this function has the additional constraint that all the vectors must be the same length; this is encoded in the n variable in the type signature, which has to be the same for both vector arguments. Great. This makes sense. How about something that violates the constraint? Whoa! So this will happen when I try to call this function. Let’s assign the result to a variable. This won’t even compile! We are trying to assign a 1-element vector to a 2 element vector. Philip Wadler’s very accessible Theorems for free! paper discusses the idea of getting theorems (a scary math word which essentially means a property you can assert by reasoning about other known properties or observations) from programming language types. Think about what this does. Remember the function is pure since it has no reference to IO or similar in the type signature. Also, notice that we aren’t saying anything about the type variables a or b; they could be anything and the function cannot really do anything specific with a or b since it doesn’t know anything about them. (As a side note, this is generally true in any pure functional language such as Haskell; for a nice discussion of this in Haskell, see Real world Haskell). So there’s literally nothing a function with this type signature could do other than return a, regardless of what a is. In this case, the type specifies everything so it essentially stands as a property. The Refl refers to the type being reflexive, meaning one side equals the other. Obviously this particular example is contrived, but it gives you a sense of what is possible in the language. Idris is not a language ready for production use, yet. Much of Idris is still pretty over my head right now, but it’s a very interesting language that I would like to begin playing around with and tracking closely. The funny thing is that getting into this led me towards finally deciding to take the deep dive into Haskell! In contrast, Haskell is used in production in more and more places and continues to get more accessible and palatable (library availability, tutorials, etc.) with every passing year. Plus there’s all the new languages so heavily influenced by it (Purescript, Elm, etc.). 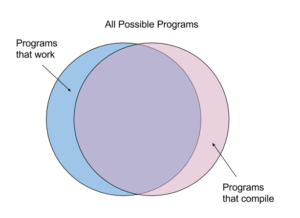 Dependently-typed languages are definitely an emerging area of programming language research that could mean big things, but they are still in their infancy in terms of general purpose use outside of academia. I’ve finally decided that in the meantime, I need to get myself to the next level of type safety and correctness and get some serious Haskell under my belt!